After I saw this collection reviewed online, I knew I just had to have these crazy polishes! These are from the new Milani collection that includes One Coat Glitters and Jewel FX, and every single one is stunning! 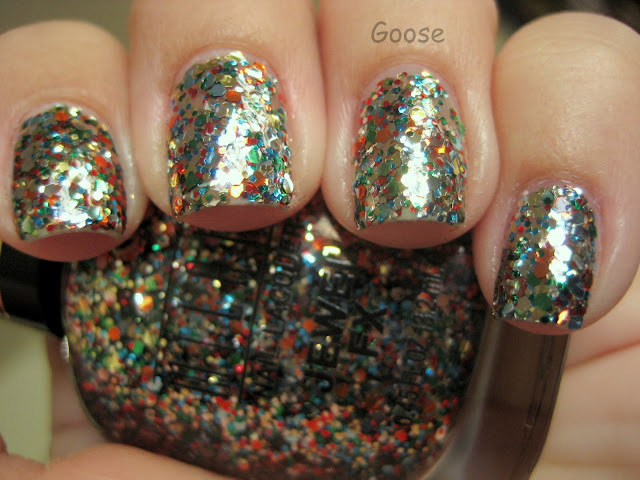 The first is Silver Dazzle, and I think it's my favorite of the glitters. It is a cool-toned charcoal grey glitter that really sparkles with a topcoat. It actually looks pretty cool without a topcoat as well - it has a gritty, matte look which looks very wintry to me. It would also probably look neat with a topcoat and a matte topcoat (to get rid of the rough glitter finish). This is two coats shown. The other glitter I picked up was Gold Glitz. This is ONE COAT! I love warm-toned golds, as they tend to look better on my skin, and this one is perfect. It's a very beautiful holiday color! I didn't pick up the red, purple, or blue glitters because I have some similar, and I'm trying not to buy nail polishes that I have near dupes of (but the One Coat Glitter formula is pretty awesome, so it might be worth it!). If you'd like to see swatches of those, check them out here! There are two Jewel FX polishes in the collection, and the first one is called Gems. It is a whole bunch of multi-colored glitter in all different sizes. While the One Coat Glitters contain a whole bunch of microglitter, this has only larger pieces, and it makes it a little easier to clean up (though still hard to remove). It is rumored to be a dupe of Lippmann's Happy Birthday, but it's actually missing the pink/purple glitter (you can see a swatch of it here). Other than that, it's VERY similar with the different shapes, sizes and colors of glitter. This one reminds me of a nutcracker for some reason, and feels like a holiday color, though you could wear it year-round. This is three coats, though the last coat was more of a "touch-up" to cover any bare spots. 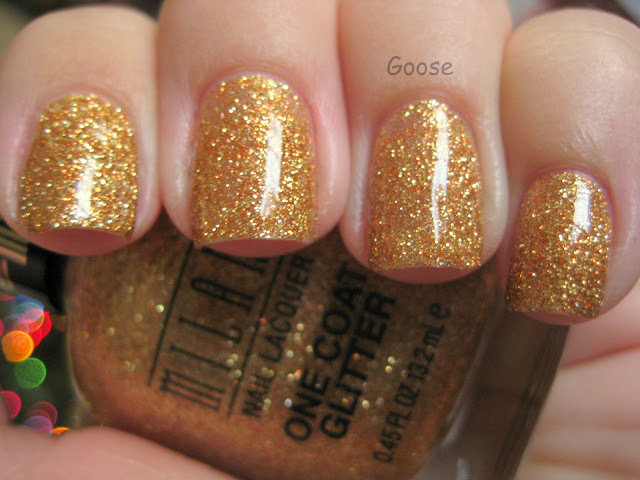 The glitter in this has to be controlled a little to "place" it in the right spot, but it's not too hard to do. This is Gold Jewel FX, and I think this is as "mirror-like" as you can get without having Minx. It is truly spectacular in person. It's cool-toned gold, but luckily it still looks nice on me, and I will SURELY be wearing this one (I don't even care how painful the removal will be). This was two coats, and again it's best to push around the glitter to place it where you want it, especially on the second coat. It was SO easy to clean up (I took it off before it dried) because the big glitter pieces don't get EVERYWHERE like the microglitter does. Here's another pic to try and show off this "mirror" finish. These could all be a horror to remove, but if you remember the foil method for glitter removal, then they shouldn't be too bad. Just soak a cotton ball in pure acetone or acetone polish remover (I usually split the cotton balls in half so I don't use as many), place it on the glitter polish and wrap it in aluminum foil (so that it doesn't evaporate). Wait for about 5-10min before pressing down and sliding it off. Be sure to moisturize your fingers after soaking them in the acetone! Do you like these new glitters? Are you willing to put up with crazy glitter removal for these beauties? have you tried the foil method to remove glitter polish? I am posting a how-to right now I will link back...its super easy and WORKS! i'm in love with the first one. the gold foily glitter is so nice too! these are actually much prettier than what i had imagined! i hope my town actually gets some milanis in soon! I loooove Silver Dazzle, it looks so good! 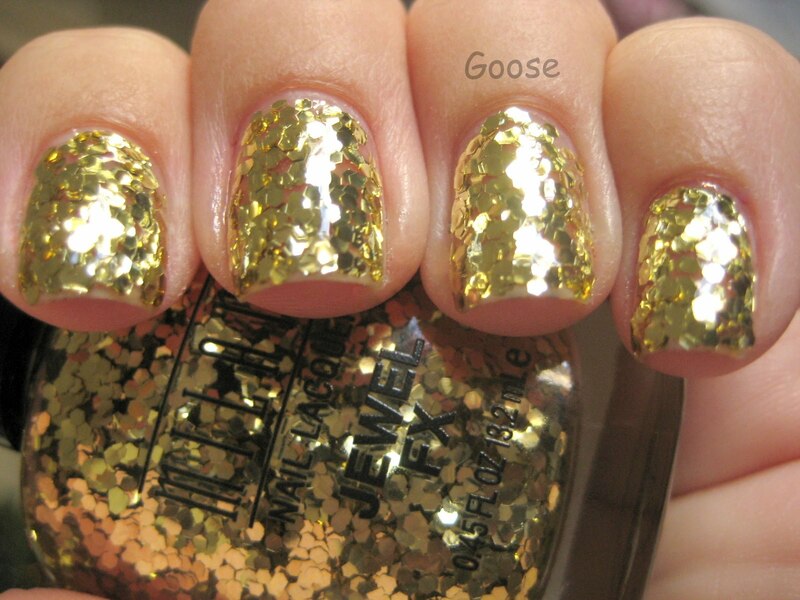 Gems and Gold are awesome, I think they're also great for nail art. Thank you for the beautiful swatches! I think I want the gold spangly one too now. I hate removing glitters but those FX colors look so so worth it to me. I have had my eyes peeled for them but haven't had luck finding them yet.